Forever Adventuring | Life is more fun when you are adventuring. Last weekend, I had the wonderful opportunity to explore Yosemite with Brian and a few of our friends. I had driven through Yosemite before, but had never hiked here, which was something truly humbling. We hiked the Half Dome trail, which was about 15 miles with 4,000 feet of vertical gain. The trail climbs past Vernal and Nevada Falls, meanders past the beautiful Merced river, and then makes the final ascent toward Half Dome. It was definitely one of the most demanding hikes I have ever done. On our way back down, having covered about 12 miles at this time, we were hungry! We found a beautiful little swimming hole by the river, filtered some water, and made trail tacos I had dehydrated the week before. I can’t even begin to tell you how well these hit the spot. The meat rehydrated perfectly, the tortillas were easy to pack, and the squeeze cheese, well, it’s pretty much my favorite backcountry comfort food. Whether on a long day hike or backpacking overnight, these will be your favorite, too! Brown meat in a saute pan over med-high heat. Make sure to crumble the meat so it dehydrates more evenly. After the meat is no longer pink, add the seasonings and 1/2 cup water. Simmer over medium heat until the water has evaporated. Remove the pan from heat and stir in the salsa. Line two dehydrator trays with plastic inserts or parchment paper. Allow the taco meat to cool completely before transferring it to trays, divided evenly among the trays. Set the dehydrator to 155ºF for five hours. After five hours, flip and peel off the plastic trays or parchment, so the taco meat is directly on top of the dehydrator trays. Continue to dehydrate for another 6-7 hours until crumbly and brittle. Transfer to a vacuum seal bag, big enough to add water to on the trail, and seal with an oxygen absorbent packet. Store in the fridge until you’re ready for your trip to keep ultimate freshness. Cut off the top of the vacuum seal bag and add just enough water to cover the taco meat mixture. Stir and set inside a mylar bag or coozie and let sit for 10 minutes. Add the meat and squeeze cheese to the tortillas and call it taco Tuesday! Dehydrated trail tacos along the Merced River in Yosemite. I’m still on a high from my backpacking trip on the Lost Coast Trail this past week. You can read about that adventure here. One of the things that I didn’t include in my original post is what I ate, but it is definitely not something to be overlooked. Finding delicious ways to stay fueled on the trail can be tricky, but with a simple dehydrator, you can make some awesome recipes, like the one below. You might recall my first attempt at using a dehydrator to make Dehydrated Trail Sloppy Joes. Those turned out amazing and I couldn’t wait to create some new recipes. This last week on the Lost Coast, my meals consisted of Spicy Breakfast Burrito Bowls, Dehydrated Watermelon Chips, Penne with Turkey Meat Sauce, and Chili with Roasted Sweet Potatoes. All of them turned out better than I could have expected, and I’m excited to share the recipes with you. This first recipe—Chili with Roasted Sweet Potatoes—is flavor-packed, rehydrates easily, and provides lots of great carbs and vitamins to keep you fueled on long hikes. The recipe serves four, but I only ended up dehydrating half of it and eating the other half for dinner the night I made it. Whether you eat it fresh off the stove top, or rehydrated on the trail, I guarantee this recipe will be one of your favorites. Add ground beef to a large pot over medium-high heat. Crumble meat and brown until no longer pink. Once the beef is cooked through, drain the fat and transfer meat to a small bowl. In the same pot, add the diced onions, bell peppers, and garlic. Cook, stirring occasionally, until soft. Add the beef back to the pot and all the seasonings. Stir to combine. Add the tomatoes, tomato sauce, and beer to the beef mixture. Stir and reduce heat to a simmer. While the chili is simmering, scrub the sweet potatoes and small dice with the skin still on. Transfer to a bowl and drizzle with olive oil and a few pinches of salt. Toss to cover all the potatoes. Transfer the potatoes to a parchment lined baking sheet and roast for 30 minutes, until golden brown. I usually stir the potatoes half way through to make sure the bottoms aren’t burning. Once the potatoes are done and the chili has been simmering for 45 minutes, add the potatoes to the chili mixture and stir to combine. Check and adjust seasonings as necessary. Line four dehydrator trays with plastic inserts or parchment paper. Allow the chili to cool completely before transferring it to trays, one serving per tray. Set the dehydrator to 155ºF for five hours. After five hours, flip and peel off the plastic trays or parchment, so the chili is directly on top of the dehydrator trays. Transfer each portion to a vacuum seal bag, big enough to add water to on the trail, and seal with an oxygen absorbent packet. Cut off the top of the vacuum seal bag and add just enough water to cover the chili mixture. Eat right out of the bag and enjoy! Chili going into the dehydrator. The final product on the trail, Dehydrated Chili with Roasted Sweet Potatoes. 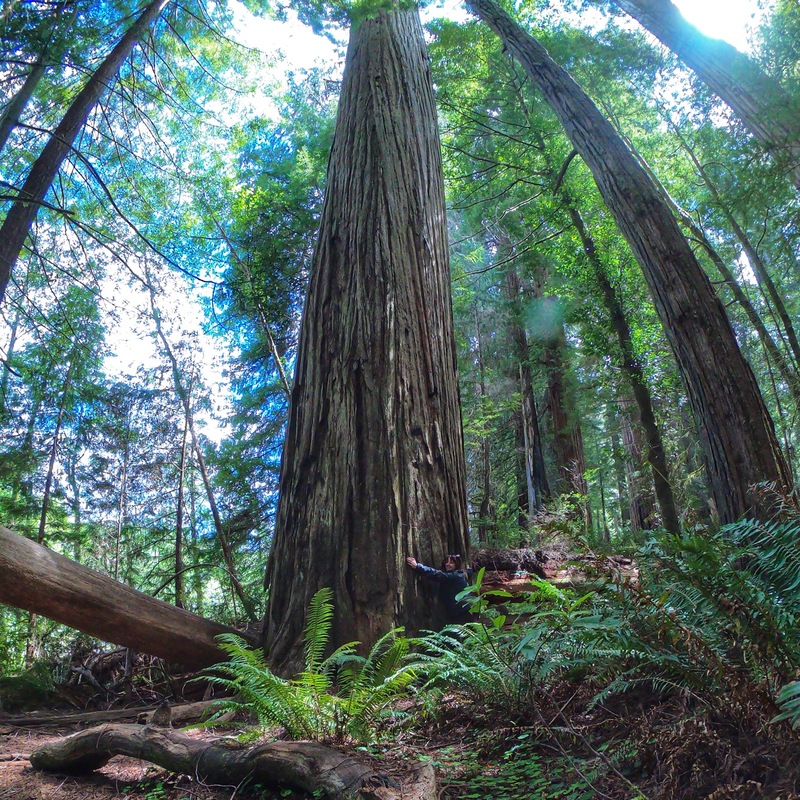 The Lost Coast Trail stretches a rugged section of the Northern California coastline where the redwoods meet the sea. It begins at the mouth of the Mattole River and travels south to Usal Beach. There are two sections of the trail. The north section is 25 miles and follows the beach from the Mattole trailhead to Black Sands Beach. The south section begins at Hidden Valley and travels 29 miles south atop the ocean cliffs and redwood forests. This past week, I had the opportunity to backpack the northern section with one of my closest girlfriends. What follows is a video of our trip and a written summary with some tips and learnings from our journey. Permits: Required for overnight stay in the King Range Wilderness. There are 60 permits per day available in peak season and 30 available per day in the off-season. I recommend you get them well in advance here. Getting to the Trailhead: To make logistics of getting to the trailhead much easier, book a shuttle service. 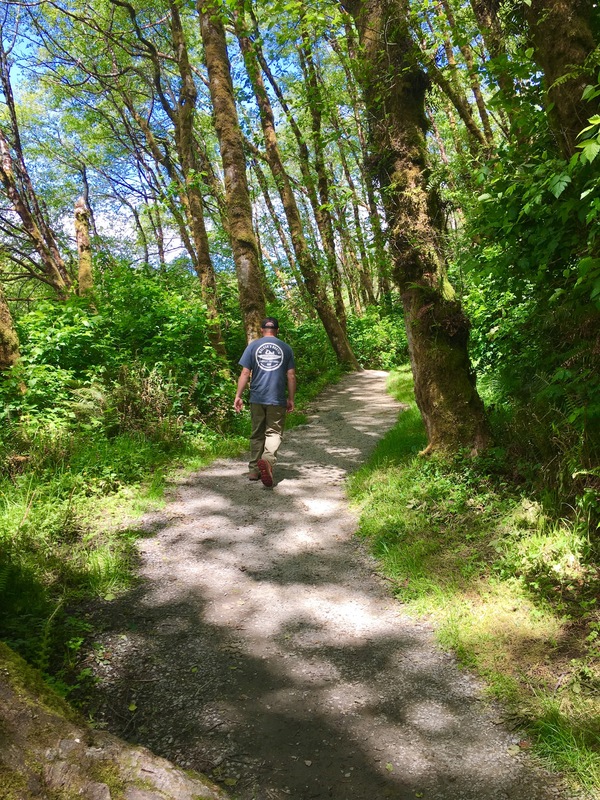 We used Lost Coast Adventure Tours and the driver, Mike, was great, providing us with tips and recommendations during the two-hour drive to the trailhead. Bear Canisters: Required and you can get them at any outdoors store or on Amazon. You can also rent them from most shuttle services. Doing Your Business: To preserve the area and prevent piles of poop, well, piling up everywhere, the BLM requests that you do you business on the beach and let the tide take it out. It can sound intimidating, but there really aren’t that many people around and you’ll be able to find some privacy. Just dig a hole 6-8 inches deep below the high tide line, do your stuff and then bury it with sand. Staying in the Area: If you’re planning on staying in Shelter Cove the night before or after, there are several different inns you can do a quick Google search of, or stay at the Shelter Cove RV Campground, where we did. For a place to eat and get a cold drink, head to the Gyppo Ale Mill. Campsite #82 at Shelter Cove RV Campground. Watch our for airplanes! Tides: There are several sections of the trail that are completely impassable at high tide. Make sure to get a tide chart or print out one from NOAA here. You’ll want to plan your hike around these sections and the tide. Whatever you do, don’t think you can beat the tide. People have been swept out to sea before and that would be a major trip wrecker. Poison Oak: It is everywhere! Know what it looks like and be very cautious. Long pants also help. Ticks: These little buggers are prevalent on the trail and we ran into a hiker that had a couple. We were lucky to avoid any, but I would recommend bug spray and light colored clothing so you can easily see them before they bite you. Terrain: You’ll go from deep sandy beaches to overgrown bluff trails to stream crossings to navigating sections of boulders and ankle buster rocks. Be prepared for some of the most diverse terrain you have ever hiked. Weather: The Lost Coast is notorious for bad weather. Brian and I attempted this trail a few years ago in October and got rained out. I was lucky this time with abundant sunshine (and a sunburn to prove it), but the wind was something else. Wildlife: The bear canisters should give you a good idea that there are bears in the area. You should also be mindful of mountain lions, coyotes, skunks, and elephant seals. Make sure to give them the respect and space they deserve. Elephant seal colony in front of the Punta Gorda lighthouse. Trekking poles will help you keep your balance in the rocky sections and stream crossings. Gore Tex hiking boots will keep your feet dry in the wet sand and creek crossings. Low profile boot gaiters to prevent your boots from filling up with sand. Tent sand stakes and tie-downs for super windy nights. Sunscreen because there isn’t any shade on the trail or at campsites. Bug repellent to hopefully keep away any ticks. I didn’t see any mosquitoes during our time on the coast. Poop shovel to dig a hole and bury your business on the beach. Bear canister so you don’t lose your food to a hungry visitor. Rain jacket and rain cover for your backpack because it is the coast and you never know when weather will turn. Map and tide chart to make sure you are avoiding impassable sections at high tide. Passing through the last intertidal zone early in the morning. Most backpackers complete the 25 mile trek over 3-4 days. We had planned on 3 nights/4 days, but made really good time on the last day and decided to hike out. Below is our trip itinerary and where we camped the two nights we were out there. From Lake Tahoe, it is about a 7-hour drive to Shelter Cove. We left mid-morning and arrived around 6:00, with enough time to set-up our tent at the campground and relax by the fire with a few brews. Our shuttle was scheduled for a 7:00 am departure from the Black Sands Beach parking lot (upper lot). There is room for approximately 30 cars here; if there isn’t any space when you arrive, you can park on a side street and walk to the parking lot. We had to be there at 6:45 to load up and begin the 2-hour drive to the trailhead. If you get the slightest bit of motion sickness, I would recommend sitting in the front because it is nothing but windy roads the entire way. Once at the trailhead, we made a quick breakfast and then started hiking down the coast around 10:00 am. Where we ate breakfast and the start of our adventure down the Lost Coast. The first part of the trail is mostly on the beach and we took our time looking for seashells and other interesting treasures washed up on shore. This section of the trail was also incredibly windy. There were several times where we were stopped dead in our tracks because the sand and pebbles pelting our legs was so painful—another great case for wearing pants. Less than a mile from the trailhead at Mattole Beach. So many reasons to smile on the Lost Coast. At 12:30 we made it to the Punta Gorda lighthouse. There was a colony of elephant seals blocking our trail to the lighthouse. As cute as they are, we didn’t want to get too close. After very slowly and cautiously walking by, we made our way up the lighthouse and explored inside. This lighthouse was in operation until 1951, when modern marine navigation equipment made it obsolete. There is some amazing history you can read about it here. Punta Gorda lighthouse and elephant seal colony blocking the beach. View from the Punta Gorda lighthouse. After a snack, we continued on down the coast. 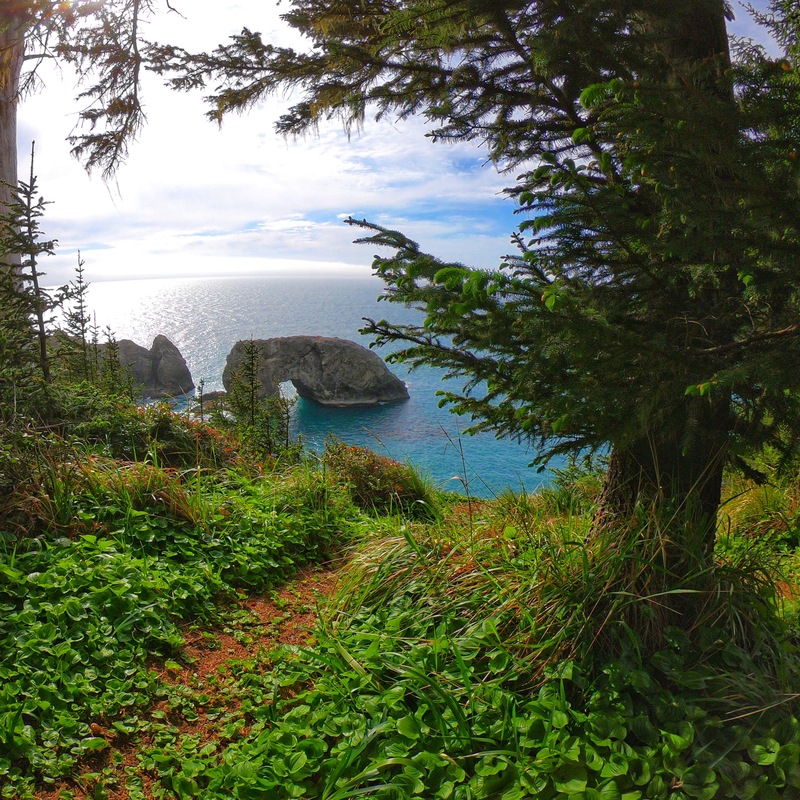 The next section of the trail was a combination of beach and bluffs to Sea Lion Gulch. Here we had to get back on the beach and cross over a field of microwave-sized rocks. This is also where you enter an impassable (intertidal) zone at high tide. Our timing was perfect and we didn’t have any issues. Just past Sea Lion Gulch, you will reach Hat Rock, which is notorious for giving hikers issues, even at low tide. There is an overland pass here, just look for the cairns to find your way up to the trail. Headed toward Sea Lion Gulch. We continued on past Cooskie Creek, which in hindsight I would have preferred to camp at to Randall Creek, where we arrived at 5:15. We were both pretty spent, and ready to take our packs off. There were two couples already here, which made camping tight, but we found a spot by the ocean and made it work. We woke up the next morning around 7:30, made some breakfast, and broke camp. We were just on the skirts of the intertidal zone and wanted to make sure that we got out before the tide came back up again. From Randall Creek, we were on the beach for a bit and then found a trail on the bluffs through Spanish Flat to Spanish Creek. This looked like a great place to camp, but we spoke to a few hikers that said it had been really windy the night before and there wasn’t much shelter. There was also a family of skunks in the area that I’d rather not make friends with. Beautiful wildflowers filled the entire length of Spanish Flat. We continued on the bluff trail to Oat Creek—which looked like another great place to camp—to Kinsey Creek, and then were directed back down to the pebbly beach until we reached Big Creek, which would be another amazing place to camp. There was a great shelter built here out of driftwood that I would have loved to stay at. 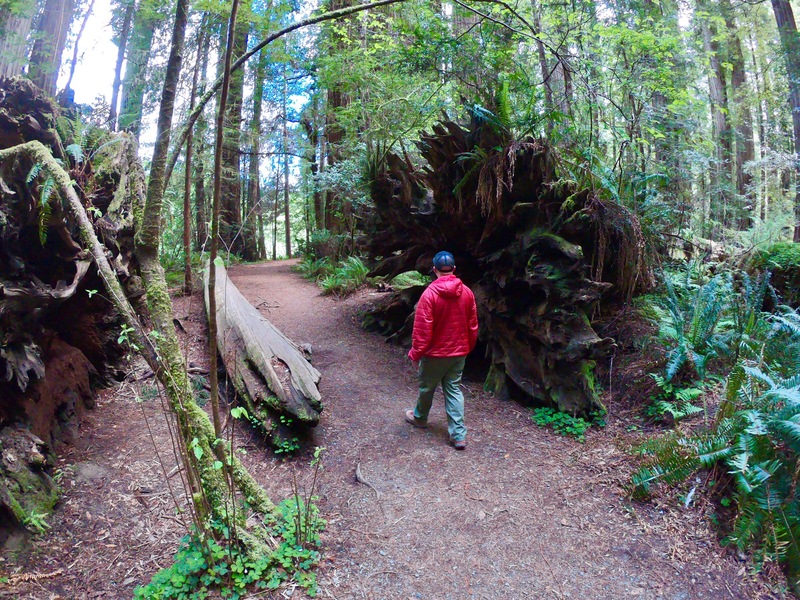 From Big Creek to Big Flat Creek, the trail consists of rocky beaches and poison oak lined trails. There was a section of the trail that was so overgrown with poison oak, the only option we had was to run, and we were both wearing shorts. Three days later, I am glad I can confidently say, I did not get poison oak. Thank goodness! Ankle buster rock section and whale bones on the way from Big Creek to Big Flat. We entered Big Flat around noon and were absolutely blown away with how “big” it really was. There was even a small air strip here for a house. I could only imagine what it would be like to have that for a weekend getaway. My stars! There was only one other house on the entire trail. Talk about seclusion. We arrived at Big Flat Creek a little after 1:00 and picked a camp spot in a small driftwood shelter made by campers before us. We were right on the beach, had easy access to the creek, and incredible views of the coast and flat. This was such a picturesque place to camp. The only negative was the wind. While the shelter provided a little wind break, it was still windy enough to require us to use tie-downs on the tent. Hiking through the last section of Big Flat. Our campsite among the driftwood at Big Flat Creek. After playing on the beach for a few hours and relaxing at our camp spot, we called it a night and tried to fall asleep with the wind blowing on our tent. It must have been around 10:00 that the wind completely died, and I had one of the most peaceful sleeps I have had camping in years. We were under the full moon, on the soft sand, and had the ocean waves breaking close by. Moon rise from our campsite at Big Flat Creek. We woke up at 4:30 am, broke camp, and had a quick snack, not wanting to waste time with a full blown breakfast. We knew we had a 4-mile impassable section ahead of us and wanted to make it through during low tide. As horrible as waking up at 4:30 sounds, it was absolutely incredible. We started hiking around 5:20, just as it was becoming light enough to see without headlamps. The air was cool and crisp, the full moon was sitting above the horizon, and we could hear coyotes howling in the distance. It was pure magic. This section consisted of a lot of rocks, pebbles, and deep wet sand. We passed a few creeks that would have been great campsites, as long as you can get back far enough in the gulch to avoid high tide. When I go back, I’d love to camp at Buck Creek or Gitchell Creek. Absolutely stunning light at Gitchell Creek. We made it to where we intended to stay another night, Horse Mountain Creek, at around 9:30 am. At this point, we realized we were less than 2 miles from the car and it was early enough in the day to make it to the car and back home to Tahoe by nightfall. With no shade and sunburned skin, we decided to make the trek out. It would have been great to spend another night, but my skin thanked me for our decision. Horse Mountain Creek is about 2 miles away from the trail exit at Black Sands Beach. Close to the end of the trail. The trail exit is just before the point in the distance. Last pic before hiking south on Black Sands beach to the trail exit. The Lost Coast Trail is darn tough. There is a reason that this stretch of land was never developed and remains in its pristine condition. It is also for this reason that I can’t wait to come back, next time with Brian by my side. It was challenging, but such an amazing experience that I’ll never forget. Have you backpacked the Lost Coast? What was your favorite part? Leave a comment below. 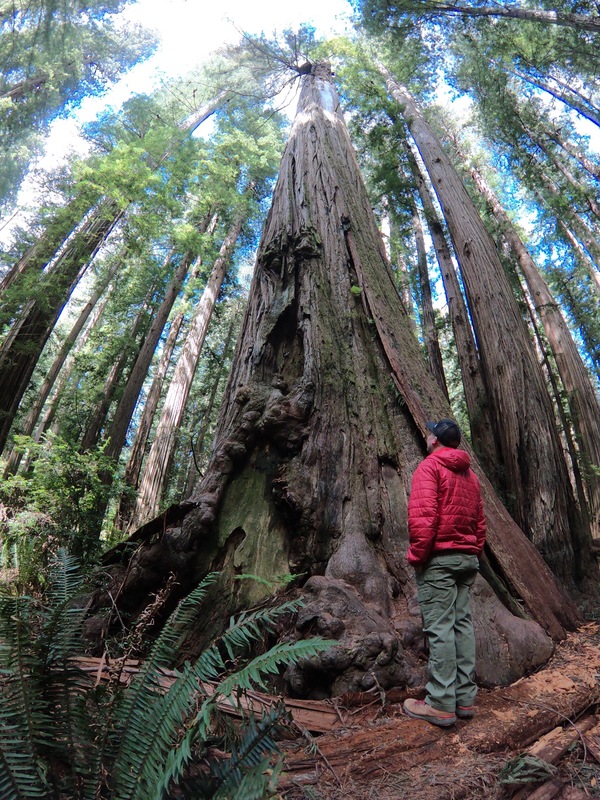 For the longest time I have dreamed of exploring the Oregon coast and Redwood National Park in Northern California. This past weekend, we made a quick trip, but were sure to get in every ounce of adventure we could in the short amount of time we had. We were also able to get in a precious visit with one of my longest and closest friends who just had a baby. Below are some of the highlights from our trip. I can’t wait to go back! We left Lake Tahoe at 8:00 am and headed North on Hwy 395 toward Susanville. Our destination today was Eugene, OR. There are many different ways that you can get here, but we opted for the more scenic route that passes by Mt. 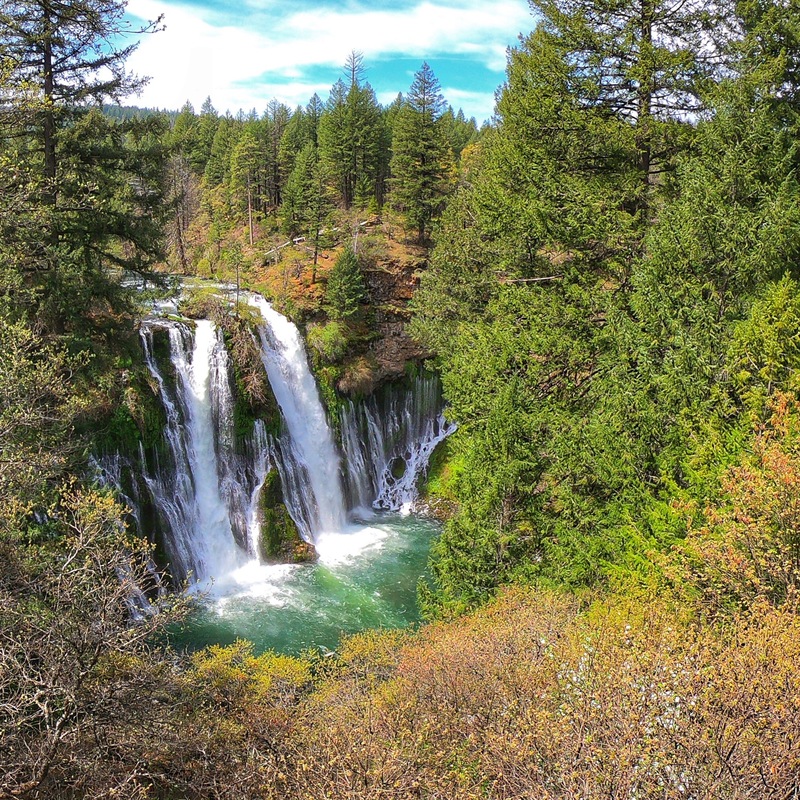 Lassen, McArthur-Burney Falls, Mt. Shasta, and then takes you to I-5. The drive was beautiful and we made note of several campsites along the way that we’ll make sure to check out next time. One of those was McArthur-Burney Falls. It is a beautiful area, has an impressive waterfall, and Lake Britton to explore. There were also probably at least 120 campsites here, with the option to rent cabins if that is more your style. We made it to Eugene about 5:00, had dinner with my friend, then Brian and I went out for a few drinks. One place I would definitely recommend is the Bier Stein. It is a beer lover’s paradise and they have everything you could image from sours to DIPAs to PBR. Make sure to check it out if you are ever in Eugene. There is also a Voodoo Doughnut that is open 24 hours just down the street. Dreams do come true! After a nice brunch at my friend’s house and more baby time (there is never enough baby time! ), we left Eugene at about noon and headed for the Oregon coast. Once again, we opted for the more scenic route along SR 126 to Florence. From here, we traveled down the 101, stopping in Coos Bay for lunch at a local brewery, 7 Devils. They had great food (I got a barley bowl with roasted asparagus, cauliflower, and manchego cheese), and a local band of old timers playing everything from the banjo to the harmonica to a homemade bass. 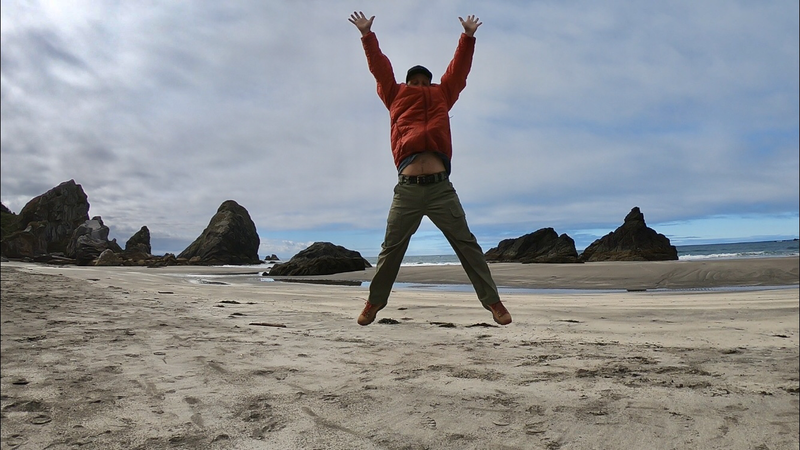 We woke up around 8:00 and couldn’t leave the Oregon coast without first exploring the beach. We headed to Harris Beach SP and wandered around on the beach checking out the tide pools lined with sea anemones and starfish. 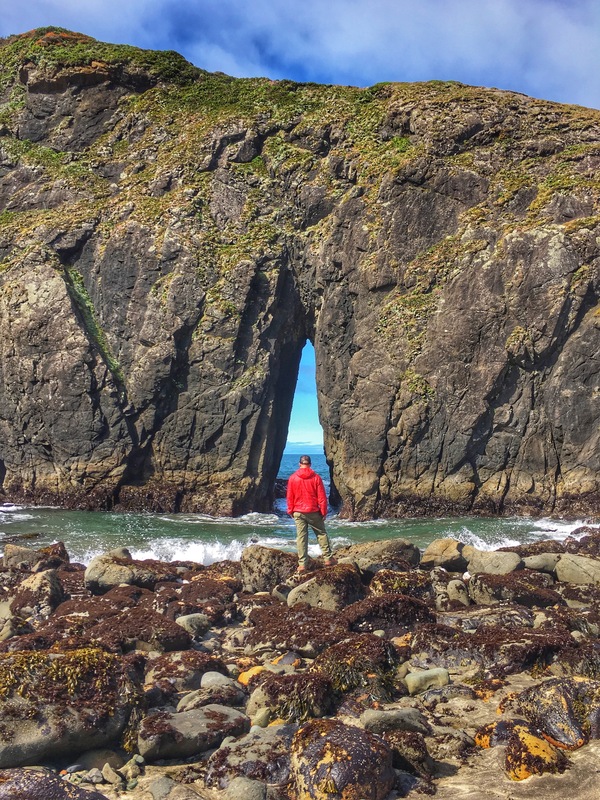 This beautiful stretch of beach has some amazing rock formations and all sorts of things to explore. This would be another great place to camp that we can’t wait to come back to. 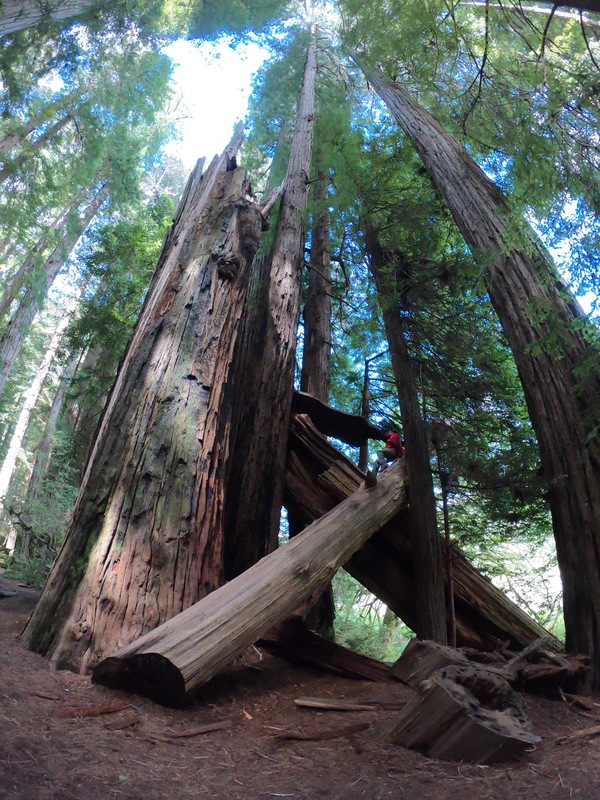 After the beach, we set South on the 101 toward a grove of redwoods in Jedediah Smith SP that all the locals told us was a must, even though they had reservations about giving up their prime location. 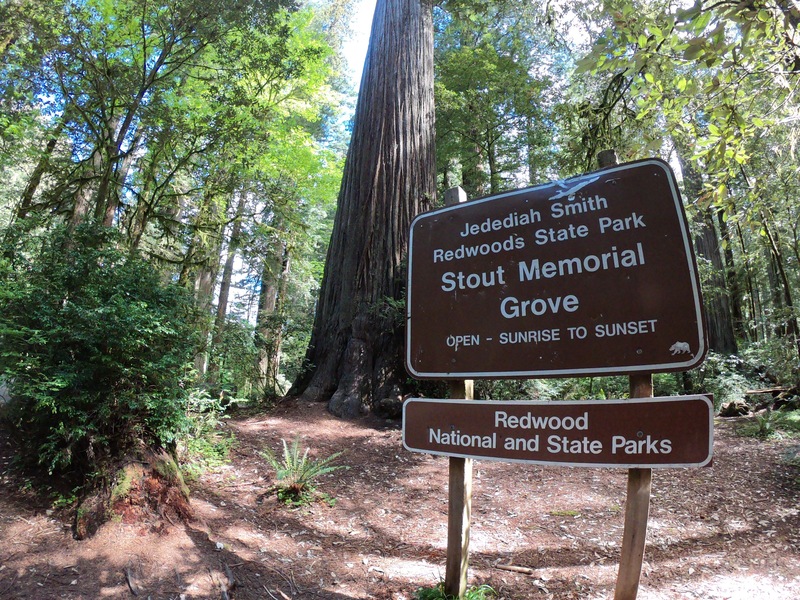 If you’re ever in the area, Google Stout Grove. The drive to get here is absolutely beautiful, off the beaten path (you’ll actually follow a dirt road to the parking area which fits maybe 20 cars), and there are no entrance fees. There are a couple of hiking options, one mile through the grove and a few spurs that go along the river. Either way, you’re likely to pass by the largest tree that I have ever seen, which is 17 feet in diameter! It is absolutely jaw-dropping. 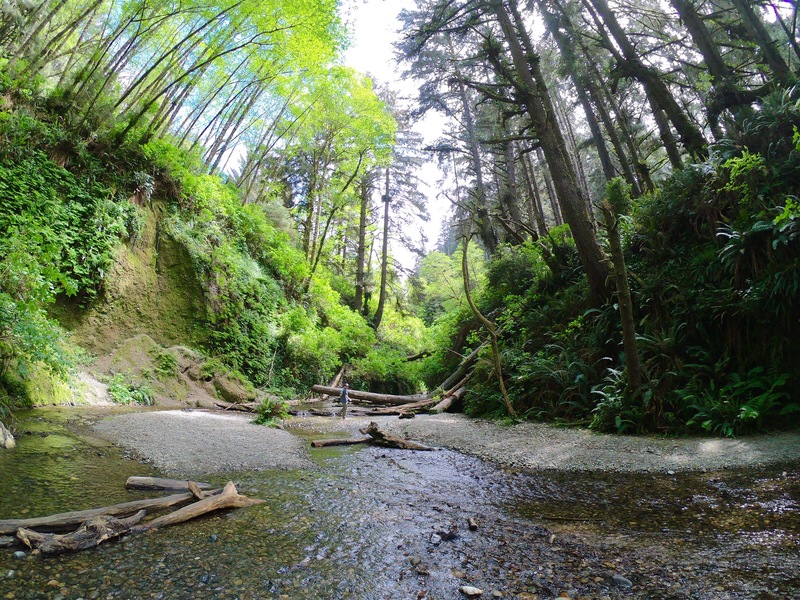 After we moseyed through the grove and took copious amounts of pictures, we headed to the next spot on our list, Fern Canyon in Prairie Creek Redwoods SP. The drive to get here was equally as beautiful as the drive to Stout Grove and leads you to the ocean with gorgeous views of the coast. It was $8 to enter here, or free if you have a National Parks pass, and there is a lot to do and see. One thing at the top of our list next time, is to camp on the beach at Prairie Creek campground. We also can’t wait to go back to Fern Canyon. 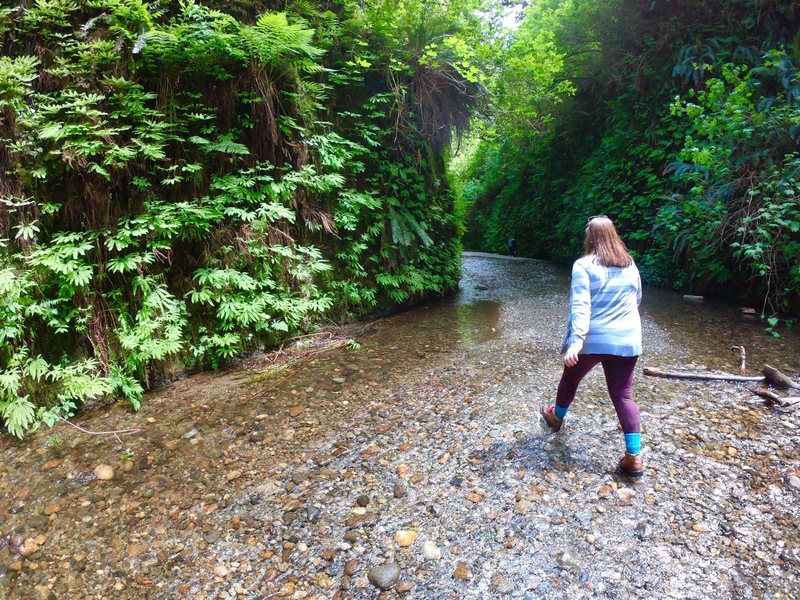 Walking through Fern Canyon was like nothing I have ever experienced. It’s a little less than a mile from the trailhead to the canyon and you will know when you get there. The walls must be 20-40 feet high and are lined with ferns and some of the most dense greenery I have seen. There is a creek you follow the entire way and lots of opportunities to get your shoes wet. I was wearing waterproof hiking boots (that turned out to be not so waterproof), and will probably opt for sport sandals next time. 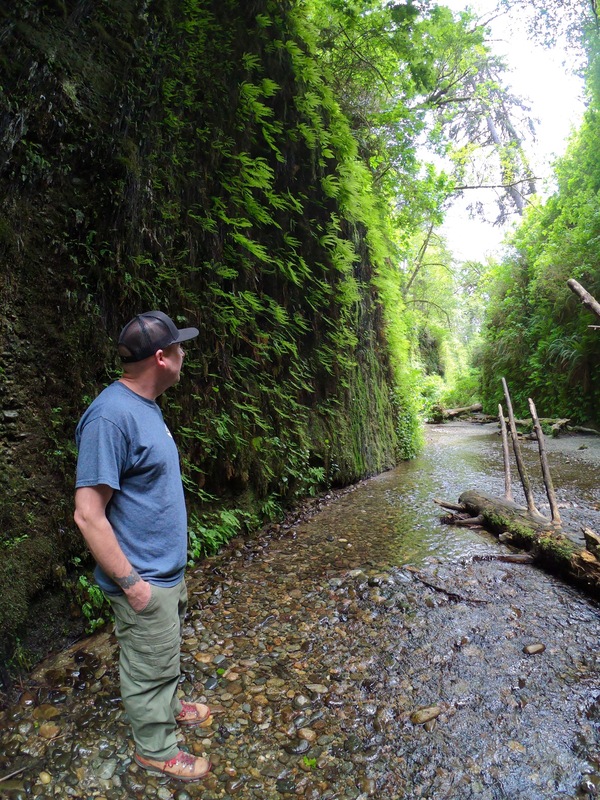 Either way, Fern Canyon is a must if you are ever in the area. From here, we headed to Eureka for our last night of the trip. Eureka was a quaint town, but I gotta tell you, Sundays are completely dead. The whole downtown area with cute shops and restaurants was all closed. We still managed to have a fun evening with a little bar hopping starting a Lost Coast Brewery and then going to Humboldt Provisions, the Shanty, Vista Del Mar, and Steve and Dave’s. You could probably skip the last two, but the other three were pretty fun. The day we always dread, the day we come home. We left the hotel at 6:00 am and hit the road to make it back in time for Brian to be at work by 2:15. Of course, we opted for the pretty and slightly slower route, which lead us through some beautiful country. Although we made it back with only 15 minutes to spare for Brian to be at work, it was worth every second. 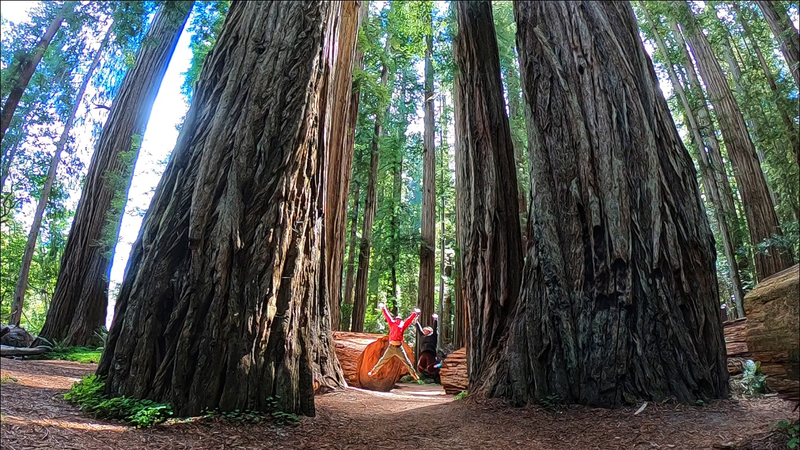 I am already daydreaming of our next trip to Oregon and the Redwoods. It is an amazing area, and seeing a longtime friend along the way, is always a bonus. Have you ever been to the area? What was your favorite thing to do? It’s that time of year again. The time of year where it seems like every person who has a blog or social media presence is posting about one of two things: 1) a review of the previous year, or 2) what their goals are for the coming year. While cliche, I do think that reflection and goal-setting are an important part of personal development. I also believe that there is something to be said about making those things public. If you’ve announced the ways you plan to grow and develop to the entire world, you’re that much more likely to do it, right? It’s worth a try. I can’t believe it. My little girl turned 11 today. Over the past 11 years, she has taught me patience and responsibility, but most importantly, unconditional love. Roxanne has been by my side through ups and downs, and always, always, loves me no matter what. There really is something to be said about the loyalty and comfort that dogs can provide. Over the past year, we’ve really started experimenting with new recipes in our cast iron dutch oven every time we go camping. I wasn’t sure what I was getting myself into at first, but I have come to absolutely love it. It’s probably because I just put the stuff in the dutch oven and then Brian does all the hard work—moving it around, putting coals on top, making sure it is the right temperature—but between the two of us, I think we have a pretty good thing going. I can’t believe it’s taken me two months to write about my awesome trip to Kauai, but better late than never? This was my fourth (or fifth??) time visiting this amazing island and it did not disappoint. If you’ve ever heard the term “island time,” you know it refers to a slower than average pace. Like a really slow pace. I only wish that vacation went by in “island time” speed. Instead, it seems more like time is on steroids and goes by way too fast. There is just never enough of it. We definitely made the best of our time though and I’ve put together all the highlights of each day. I am so excited that I got my first girls’ backpacking trip in this summer! Several summers ago my friends, Lisa and Jenn, became my wilderness soul sisters. We backpacked together four times that summer (Desolation Wilderness, Grouse Ridge, Bear Lake, and Star Lake) and haven’t done it since. We made a point to get out the other weekend to somewhere new and beautiful, Loch Leven Lakes. It has been so nice to be outside in Tahoe lately. Spring (summer?) is finally here and the weather has been perfect the past few days. If you’re anything like me, when the weather gets warm, one of my go-to things to eat for lunch on a weekday is a big salad with whatever leftover protein I have in the fridge from the night before. When I graduated with my MBA this time last year, I told myself that I was going to get back to one simple thing that helps make me feel whole–running. Well, a year has passed and I haven’t run more than a few days in each week…and there have been lots of weeks when I didn’t run at all. We can all relate to the excuses of work, life, weather, etc., but the fact is, if you really want it, just do it. In my last post, I wrote about finding a little gem of a beach when we were driving home from Tomales Bay, CA a little over a month ago. This past weekend was Memorial Day and we decided to make a trip back to the coast to explore here some more. The little town of Dillon Beach, CA is located at the mouth of Tomales Bay on the Sonoma Coast. Without traffic, it is almost exactly a four hour drive from Lake Tahoe. We packed up and left on Saturday morning and were at the campground by mid-day.